Grand Cayman, Cayman Islands (April 25,2016) - The beaches, roads and reefs of the Cayman Islands have been tidied up just in time for the summer tourism season thanks to hundreds of volunteers who helped with the annual Earth Day cleanup April 16. Eager to help, Red Sail Sports employees accompanied by Operations Manager Rod McDowall, rose early that day to pick up trash in the Safehaven area where the company docks its Catamarans and dive boats. After they collected bags of trash, the volunteers put in a full day of work at the beach or on the catamarans. Hundreds of volunteers collected tons of trash across the island that day. Earth Day is recognized across the world as the day to focus on protecting the environment; something Cayman’s dive operators do all year round. In honor of Earth Day celebrations Divetech offered free tanks and weights for divers willing to help clean up near shore reefs. Divetech also offered a free dive trip to divers willing to participate in a fish count at the Kittiwake Wreck for on-going conservation studies. Red Sail Sports offered a free dive trip for volunteer divers who participated in a Lionfish cull. 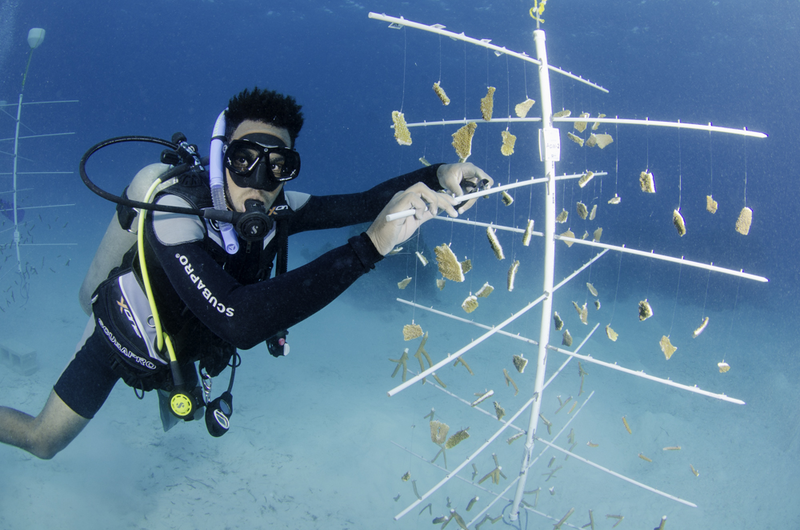 In honor of Earth Day Ocean Frontiers also announced the installation of Grand Cayman’s biggest coral nursery in the East End of the island near the dive shop. The Cayman Islands Department of Environment is working with Ocean Frontiers and other local operators in coral garden projects. Divetech and Red Sail Sports also participate in educational programs year round to teach island schoolchildren about conservation. The Southern Cross Club in Little Cayman is a long-time partner in an important research program to protect the endangered Nassau Grouper. All the dive operators heavily promote conservation in pre-dive briefings and encourage guests to be careful while observing reefs and the creatures that live there. Trash is also a problem; discarded bottles, cans, fishing line, weights and other garbage end up on fragile reefs, causing problems for the marine life. With an eye to a sustainable future Sahm attended Earth Day Texas, the world’s largest annual forum for sharing conservation initiatives, discoveries, research, innovations, policies, products, and more. He says everyone can play a big role in creating awareness and action to protect the environment, and it is up to us to work together to build a more sustainable future. Everyone agrees keeping Cayman’s natural environment clean and healthy is good for tourism. The cleanup was done just before one of Grand Cayman’s most popular summer dive attractions – the annual migration of millions of silversides that fill island’s near shore reefs during June, July and August. Dive sites like Devil’s Grotto, Eden Rock and now even the Kittiwake Wreck become sites of Cayman’s famed “Silver Rush” – tarpon feasting on the swarms of tiny silver fish. Going ‘Back to Nature’ for Earth Day is also a good reminder for everyone that turtle nesting season is approaching. Trash-free beaches enable turtles to find good nesting sites and increase the chances of hatchlings surviving. Another 11 Red Sail Sports volunteers participated in the ‘Shake Your Tin For Nature’ campaign to help raise awareness and collect money for the National Trust of the Cayman Islands environmental and education programs. They were among 300 volunteers placed in high-traffic areas with banners and signs to remind commuters of the importance of Earth Day. The Cayman Bottom Times is news collaboration by five leading dive operators to promote the superb diving of the Cayman Islands, and keep the diving public informed of important developments and events. Divetech, Ocean Frontiers, Red Sail Sports and Sunset House in Grand Cayman, and the Southern Cross Club in Little Cayman, all members of the Cayman Islands Tourism Association, represent more than 100 years of solid experience in a destination that is recognized as the birthplace of recreational diving. With a unique combination of deep wall and shallow reef diving, several wrecks, and world-famous Stingray City, the Cayman Islands has cemented its place as the top diving destination in the Caribbean. Offering diverse and wide-ranging dive programs on both Grand Cayman and Little Cayman, the members of this dive group represent the best Cayman has to offer; Divetech www.divetech.com, Ocean Frontiers www.oceanfrontiers.com, Red Sail Sports Grand Cayman www.redsailcayman.com, Sunset House www.sunsethouse.com and the Southern Cross Club www.southerncrossclub.com. Media Contact: Adela Gonzales White at Adela.G.White@comcast.net or call (941) 350-8735.